Site works were initially due to begin last year. Work will now start on April 4 and be completed by June 20. Work to protect the long-term integrity of the quay wall at Rothesay Ferry Terminal is now due to begin next month. An £833,000 contract was awarded to contractor Lochshell Engineering for the project, which will see a series of protective screens installed. The ‘scour baffle screens’ measure eight metres wide by 5.6 metres high and will minimise the effects of propeller wash which currently affects the masonry quay wall located beneath and to the rear of the suspended deck of the ferry berth. Site works were initially due to begin last year, however, these have been rescheduled following an extended period of off-site fabrication and design with a view to reducing time on site. The work will now start on April 4 and will be completed by June 20. Work will mostly be carried out overnight to minimise disruption to ferry services. Councillor Ellen Morton, depute policy lead for roads and amenity services, said: “This work represents a large investment in securing the future of Rothesay Ferry Terminal for generations to come. “In the short-term there will be some changes to ferry services, but we have done everything we can to minimise this, including by having the work carried out at night. Noise will be minimised as much as possible and the impact on ferry services and harbour operations will be minimal. 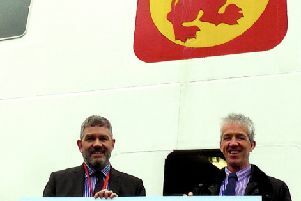 Ferry operator CalMac’s director of service delivery, David Gibson, said: “The nature of this work means it will be necessary to run a slightly amended timetable during this period. “Due to one of the two vessels that service this route having to berth overnight elsewhere during this work, the second sailing departing Rothesay and second last sailing departing Wemyss Bay will be cancelled. This is to allow the vessel to reposition. With the exception of key events or local holidays, our analysis show that there will be sufficient capacity remaining throughout the day. “However, we have negotiated access to the overnight berth during local holiday events to ensure capacity is maximised on the occasions where it is most required. The amended timetable during the works can be viewed online at www.calmac.co.uk/service-changes/rothesayquay.